I am wrapping up my season, and 2011 too, for that matter, with what might be the greatest Triathlon spectacle I've heard of since I was first captivated by the Ironman World Championships at the fable location simply termed "Kona". The privilege of participating in EpicMan on December 29th, still keeps me up at night in anticipation. 7.2 mile swim, 336 mile bike, and a 78.6 mile run. Non Stop. On the island of Oahu. The cut off time…New Years - 60 hours after the start. 24 competitors to throw down and see who can get it done first. Getting to the starting line of this event will be in no small part owed to the town of Pittsfield, Vermont where I have lived and trained all of this 2011 season. And as I exit 2011 and head to 2012, I want to give something back to the town that stood vigil over my runs through the mountains. The community here is something deeper than I've known elsewhere. And this showed most prominently when Pittsfield was recently struck by Hurricane Irene. I still pass the collapsed houses and properties on my rides and runs. I still can’t ride without considerable detours and construction plaguing the trip. I’ve seen resolve and strength in the people of Vermont that far outshines anything that I've encountered. I am in admiration. This is why I will be competing in EpicMan to raise money for The Pittsfield Hurricane Relief Fund, www.pittsfieldhurricanerelief.org, in an effort to help this town to which I owe so much. So as I head into the Double Ironman this weekend in VA and as I ready for Epicman in December I am going to continue to point everyone to: www.pittsfieldhurricanerelief.org. There was an outpouring of support immediately after the hurricane, but this needs to continue. Just like an extreme endurance event, focus and persistence are required. We still have a long way to go to get back to where we were. 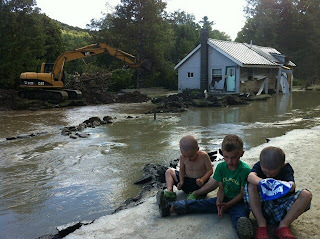 This is why I'm dedicating my racing of Epicman to raising money for www.pittsfieldhurricanerelief.org. Please contribute directly on that site or contact me as JasonJ@SpartanRace.com if you can help in any other way.